Probably the most important reason why people come and visit Elbrus area in summer is to climb Elbrus. We offer different climbing programs: skiing and walking, ascent from different sides, expedition style and fast climbs. Despite the fact that Elbrus is the highest peak of the Caucasus, it is far from being the most difficult one and is maybe not the most interesting one. 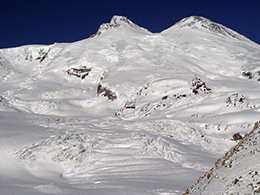 We have climbing programs on other less well-known alpine peaks, which can serve as an additional acclimatization program for your Elbrus climb. Not everybody who comes to Elbrus area in summer intends to climb Elbrus. There are lots of other beautiful places to visit and interesting things to see. Joining us for one of our different trekking programs for one or more days, you will have the chance to learn more about the unique nature of the Northern Caucasus with its flora and fauna, but also get an insight into the old Caucasian culture and almost lost traditions of the local Balqar people. A trekking tour can be designed as an active acclimatization program before your climb of Mt. Elbrus, but also as a trip to relax after a succesful climb. Come and join us for extreme downhill and freeride riding on our lifts on Elbrus and Cheget, and also for bike tours around Elbrus.